As I was preparing for this Sunday, I had flood-damaged Buffalo Mountain Camp, and how Cassidy UMC can raise money to help, in mind. 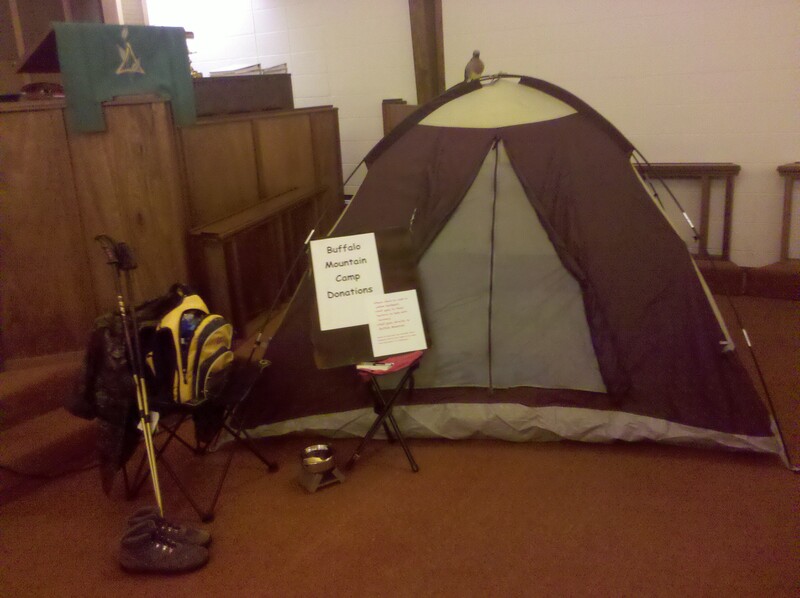 So, as you can see, I made a little camp scene in the sanctuary to remind us of the situation. I ran into one problem, however. When I went to set up the tent, I discovered that the tent poles were not in the tent bag. A tent without poles is pretty useless. It is basically a puddle of polyester. Often, we think of tension as a bad thing. Tension can be a good thing, however. Like a tent, our lives can be shaped by certain kinds of tension. The tension may even be what makes our lives livable. During our series on James, we’ve been learning a lot about having faith in Jesus Christ, and then acting accordingly, trusting God’s power to help us. I’ve talked about the need to have a faith that shows fruit in terms of Spirit-driven works. I’ve also preached on the importance of how we speak to one another, and our need to keep our heads as much as possible in the present, that place where we can engage directly with God. Melissa brought us a wonderful personal testimony last Sunday, talking about how we find joy in the midst of turmoil. In all of those ideas, there is tension, mostly the tension between what is broken and what is holy. At the end of his letter, James reminds us of the tension that exists in the universe right now, a tension Jesus Christ created by dying on the cross and then showing through the resurrection that sin and death have been beaten. A quick Greek lesson: the word we translate as “the coming” is parousia, and it’s one of those meaning-packed words that can be a little hard to translate in full. It’s about more than just arrival; it implies a full, complete presence that changes everything. In the context of Christ’s return, we know it means all things will be set right. What troubles you will be undone in a way that it will never trouble you again. I don’t care what it is—the death of a loved one, abuse you may have experienced, or tragedy that has scarred your life—the pain will go away. It is a moment that begins eternity, and it is a moment we all should crave, assuming we understand it as Christians should. While not a Christian movie, the current film “Best Exotic Marigold Hotel” has a character who lives by a philosophy that any Christian who understands parousia could embrace. “Everything will be all right in the end. So if it’s not all right, it’s not the end,” he says. James was speaking to an early Christian audience that was for the most part oppressed. Accepting Christ impacted their ability to find work, to worship as the Jews most of them continued to be, and to remain in relationship with their families. Sometimes, their beliefs cost them their lives. These people clearly craved Christ’s return—they wanted things to be all right, quickly. In the 13th verse, James takes this concept of parousia and turns it into practical advice about living. In many ways, he returns to some themes we covered when talking about living in the present a couple of weeks ago. If you’re suffering, pray—prayer is how we engage directly with God. If you’re cheerful, sing songs of praise. Again, engage with God in the present moment, acknowledging that while Christ is coming in full at any moment, God also is present with us now via the Holy Spirit. And if you’re sick—well, that’s where we receive some particularly detailed advice. Here, James’ advice is rooted in the communal nature of our faith. He tells us to seek healing in ways that require a group of Christians. We seek prayers from mature Christians around us; we receive anointing with oil as a symbol of the Holy Spirit’s presence, a presence that binds us all to the body of Christ. And perhaps most interestingly (and strangely to Western culture) he ties confession of sin to healing, making a link between our spiritual health and our physical health. Churches with active small groups, where people can be intimate with each other and share details of their lives in confidence, generally function better than churches without such small groups for a reason. A biblical cycle of confession, repentance and forgiveness cleanses the communal body and clears a path for God’s grace to grow church members in holiness. In this context, James closes with one last type of action we should consider. We not only receive healing, we pursue people in need of healing, particularly if they have been part of the body of Christ but have fallen into sin. This recommendation is along the lines of Christ’s Great Commission. We are more than passive recipients of grace. We carry grace to others, too. Yes, Christ has yet to return, but we are to live as if he has, reminding others that wholeness is available now. James offers Christians a way of thinking that is both comforting and empowering.